After declaring in 2000 that measles had been eliminated from the U.S. through a successful vaccination program, government officials now say the number of confirmed cases has reached a 20-year high as people who get the disease abroad bring it back to America. Unvaccinated residents in the U.S. and foreign visitors who traveled to the Philippines, Europe, Africa, Asia and the Pacific are the main culprits in a growing spike of measles cases in this country that began several years ago and exploded this year. To date, 288 cases have been reported in 18 states, the highest year-to-date total since 1994 when 963 cases were reported by year’s end. The overwhelming majority of U.S. cases are among people who have chosen to go unvaccinated for personal, religious or philosophical reasons, said Dr. Anne Schuchat, director of the National Center for Immunizations and Respiratory Diseases at the U.S. Centers for Disease Control and Prevention. 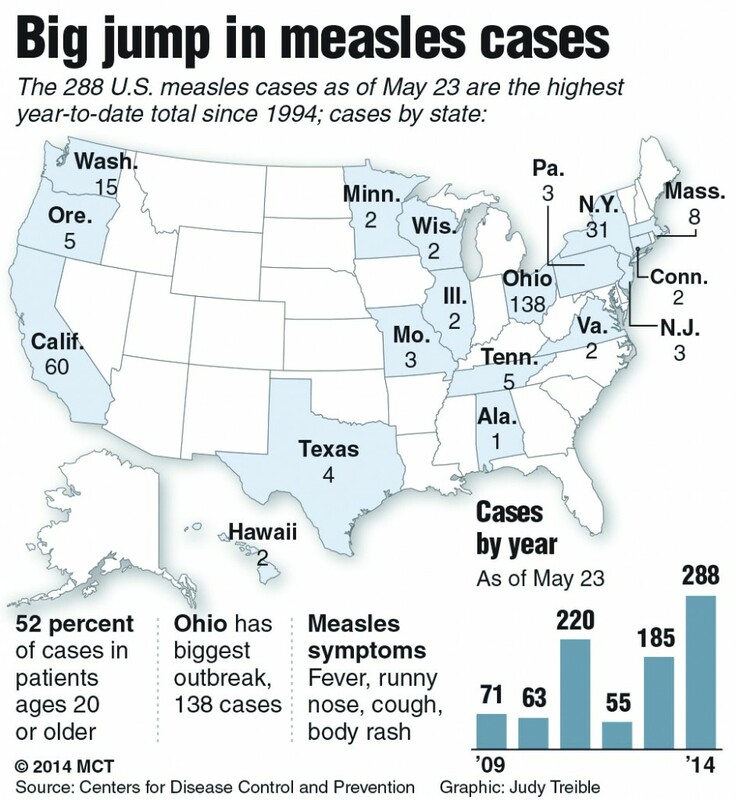 In Ohio alone, 138 cases have been linked to Amish communities where several members had traveled to the Philippines, which is experiencing its own measles outbreak with more than 32,000 cases and 42 deaths this year, Schuchat said. Fifteen outbreaks, involving three or more related cases, have occurred in places like New York City and in California, where six outbreaks were reported in six counties. Forty-three people have been hospitalized nationally, but no deaths have yet been reported, she said. Health officials are urging people to get vaccinated for measles, especially prior to international travel. A highly contagious viral respiratory disease that grows in cells at the back of the throat and lungs, measles is spread through the air by coughing, sneezing and even breathing. It can cause fever and cold-like symptoms, along with a stubborn body rash. About 10 percent of children who get the disease also get an ear infection and about 5 percent develop pneumonia. About one in 1,000 measles patients contract encephalitis and one or two out of 1,000 die. This article appeared in print on page 2 of the May 30th, 2014 edition of Hamodia.